Ultra Analog Session 2, Virtual Modular Synth from Applied Acoustics Systems. 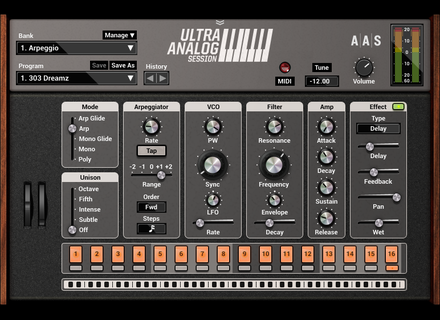 Part of AAS's Session Series, the Ultra Analog Session 2 is announced as "a simple and fun synthesizer". At its core lies a “hard sync” oscillator and filter duo supplemented by a unison aimed at delivering a rich and modern sound. Additionally, key synthesis controls, an arpeggiator, and a multi-effect module complete the package with the promise of "a direct and ludic playing experience". The factory library contains 144 presets divided into the Arpeggio, Bass, Lead, Pad, and Polysynth categories. Artists, producers, and long-time AAS collaborators Richard Devine and Sean Divine have contributed 50 signature presets each to this collection. Based on evolutions of the oscillator and filter from the brand's Ultra Analog VA-2 to create a new design, the Ultra Analog Session 2 aims at delivering rich and expressive sounds. 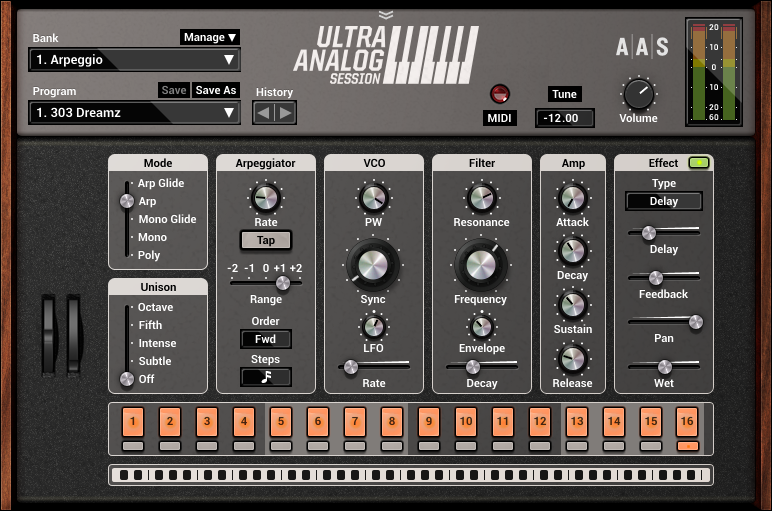 The Ultra Analog Session 2 runs on both Mac OS X and Windows in 32- and 64-bit host sequencers supporting the VST, Audio Units, RTAS, and AAX Native plug-in formats. Available now, it has a regular price set at $49, but until January 15, 2016 it is available at the special introductory price of $39. More details at the Applied Acoustics Systems website. UVI introduces Cameo Phase Distortion Suite Cameo has released the Cameo Phase Distortion Suite, a bundle including three new plugins all based on classic Casio synths. Acon Digital Releases DeVerberate 1.6 Acon Digital has released DeVerberate 1.6, adding reverb time estimation and quality improvements.